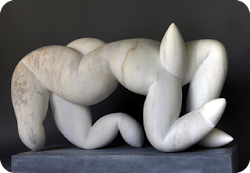 The idea behind the series was to produce a sculpture a day, for one hundred days, using the same material, marble, exploring the area between figuration and abstraction. The plan was hatched in February 2009, and completed a year later after nine months of work. The notion of a ‘sketch’ in marble is a new one, due to the availability of sophisticated power tools, and these tools are a revelation in the respect that they allow exploration of ideas and forms relatively quickly. One hundred sculptures were completed. One hundred days of work. Ten hours of work each day.